A fee is charged for each class enrolled per term. Students are expected to attend all classes and an invoice will be raised for the whole term. Fees can be paid in 2 equal instalments. Fees will only be pro rata when a student starts mid-term. An invoice for students who enrol during the year will be issued to enable payment immediately. Refunds will not be given for non-attendance, holidays or where the Code of Conduct has been invoked. Refunds will not be given where a class has to be cancelled and rescheduled for the reasons set out in Clause 14. Fees are currently exempt from VAT. Invoices must be settled at the start of each half term; fees can be paid in 2 instalments. The dates when the payments are to be paid are on the invoice. Late payments will be liable to a 5% late payment charge. New students should pay using the pro-forma invoice. Account Name: YSBD Workshops Ltd.
Bank transfers should in all instances reference the child’s name. Failure to do so may result in the payment being unidentified, the account remaining outstanding and the student not being admitted to class. 10.2 In person at: YSBD Ltd., Base Camp, Oak Road, Cheadle Hulme, Cheshire. SK8 5DR or at the Parish Rooms, Church Road, Cheadle Hulme, SK8 7JB. The Academy will not accept any liability for cash or cheques left unattended at Reception, given to teachers or any other persons not authorised to receive money. All payments must be made in accordance with Clause 10 above. All payments MUST be sealed in an envelope with the termly invoice stating the child’s name and the amount enclosed. A register for each class is maintained by the teacher and records student attendance for the purposes of attendance, health and safety and security. If a student is absent from class for four or more consecutive weeks, a refund of 90% of the fees paid for those classes not attended will be given on the evidence of a medical certificate. The medical certificate must be provided within one month of the absence otherwise no refund will be given. If a class is cancelled due to the sickness of the teacher, a health epidemic or any other seen or unforeseen event, the Academy will endeavour to reschedule the class. This may be on a different day or a different time or both from when the class was originally scheduled, and might involve an extension to the term time dates. No refunds will be given in this case. The Academy reserves the right to charge a late payment fee of 5%of the fees if an invoice remains unpaid after the first class of a new term. If an invoice has not been paid at the start of term or upon enrolment in accordance with Clause 10, the student will not be admitted to any classes until the invoice has been paid in full. The Academy reserves the right at any time during the term to ask students to leave a class if any fees remain outstanding after the start of term. Students are required to give one half term’s written notice if they wish to withdraw from classes. If a student wishes to change class or to start an additional class, the parent/guardian must give their consent in writing to the Academy Administrator so that they can be invoiced for the additional or new class. Where more than one sibling attends class, the youngest sibling will receive a 10% sibling discount on all classes. The discount will commence at the start of the next term providing at least two siblings are still present. The discount will be reversed if payment is not received in accordance with Clause 10. In the event the eldest sibling leaves during a term, the discount will not apply at the start of the next term if only one sibling remains. Physical contact may be necessary by members of the teaching faculty. If you have any concerns regarding this matter please contact the Academy Administrator. The company Principal holds a Level 1 Safeguarding Certificate. A Code of Conduct will be issued to students and parents/guardians. Failure to observe the Code of Conduct may result in students being asked to leave. The Academy reserves the right to refuse any student prior to or after enrolment. No refund will be given if the Code of Conduct has been invoked. The Academy reserves the right to alter the advertised programme and faculty without prior notice. The information in this and any other printed or electronic brochure/notice was correct at the time of printing or publication on-line. YSBD Workshops Ltd. holds information about our customers to enable us to carry out our business as a dance education and training organisation. This information includes the contact details you supply to us and may also include information on student records. YSBD Workshops Ltd. will not disclose your information to third parties outside the Academy Group except where the law allows or requires, or where you have given your permission to do so. We may from time to time contact you individually about other carefully selected Academy services which we think will be of interest to you. 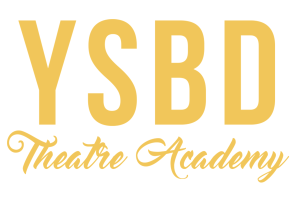 YSBD Theatre Academy is a trademark™ of YSBD Workshops Ltd. The use or misuse of the trademarks or any other content of this publication, without prior written permission from YSBD, is strictly prohibited. The Academy reserves the right to change these terms and conditions at any time providing one term’s notice is given to students. Parents and guardians of students attending classes are required to sign their acceptance of the terms and conditions for each student by signing the confirmation below and returning it to the Academy prior to the start of a new term.